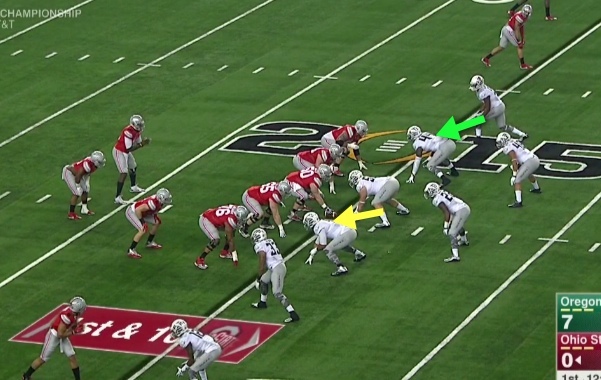 It is recognized that Ohio State beat Oregon in the National Championship game due to its superior run game, and last week we covered the first of the two major running plays that hurt Oregon, the Wham/Trap play. This week we will cover the one primary play that the Buckeyes destroyed the Ducks with, the Counter play, of which had great execution and great strategy utilized in its implementation. It is hard as a devout Oregon fan to write all the superlatives for the opponent…but they are deserved, and this review will help us learn what to look for in the coming year, and how the Oregon fan will have an informed perspective about what occurred in the NC game. As the coaches would say, this is “a learning experience,” and it is for Duck fans! My friends — don’t let your eyes glaze over! To understand the play and how it works…you have to concentrate for just 30 seconds on how the Oregon defense works…and you will need the chart above to refer to. Note how the DEs line up head-on, or a “5” technique in a typical 3-4 defensive alignment. In a typical 3-4 defensive alignment–you see our defensive ends (green arrows above) head-on the offensive tackles, thus a “5” technique that you see above in the green chart of gaps and techniques. In this defense the defensive ends are responsible for the “C” gap while the linebackers are responsible for defending the “B” gaps. (See aforementioned green chart again.) This is how we began to defend our opponents, but made a change in late 2013. In the Bear defense-note how the defensive ends are on the outside shoulder of the offensive GUARDS, by comparison. Above is a “Bear” defense that is designed to take away the inside running plays of the opponent. These defensive ends are playing the “3” technique and are responsible for the “B” gap (above). Stanford employed this against us in the past as did other teams — but we simply brought in extra TEs or H-Backs and blocked to the inside from the outside and “pinned” the defense inside with our Outside Zone Read or Sweep Read plays. The intent is clear with the Bear defense; stop the Inside Zone Read with defensive ends on the outside shoulder of the offensive guards, instead of head-on the offensive tackles with the 3-4 alignment. 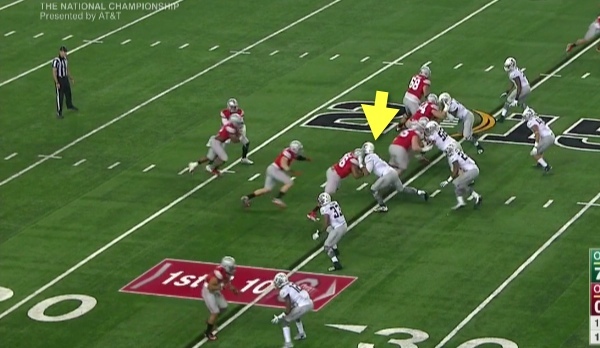 Note the alignment of the Ducks above as the nose tackle (Balducci) is lined up directly in front of the Buckeye center; this is called a “0” or zero technique. DeForest Buckner (green arrow above) is lined on the inside shoulder of the offensive tackle and is thus a “4” technique. On the other side is Arik Armstead playing the same “4” technique, thus it is a 4-0-4, or a 404 defense. Armstead defends the “B” gap. As the play above begins…the “Hidden Bear” defense emerges as Armstead (Yellow arrow above) is defending the “B” gap…as in a Bear defense, although it appears we are in a 3-4 defense where he would normally take the “C” gap. Armstead is plugging the “B” gap, while the linebacker on that side (Malone) will slide over to the “C” gap if needed. The 404 defense operates perfectly (above) as Armstead plugs the B gap, while Malone and Coleman fill the C gap nicely. This looks like a 3-4 defense, but Oregon is actually playing it as a “Bear” defense with the nose tackle “two-gapping,” or defending both A gaps, while the defensive ends are plugging the B gaps, and the linebackers taking the C gaps. It has really shut down the inside running game of many opponents since late last season when we went to it almost exclusively. The perfect “Counter” to the Hidden Bear defense. 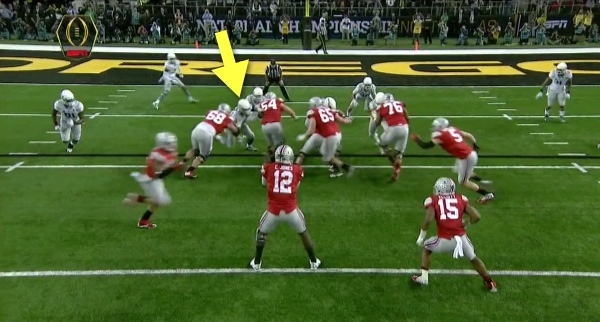 As Ohio State is beginning to run the dreaded dagger they stuck into Oregon….the Counter play, we note above how Buckner is in his “4” technique (yellow arrow above), ready to defend the B gap. The offensive tackle for OSU (red arrow above) plans to block him inside — which is an easy block since Buckner wants to go there. 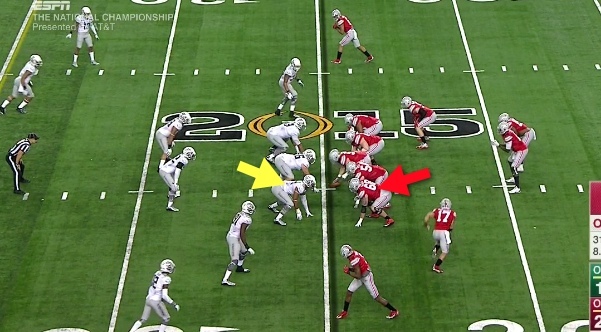 Blocking “down” or inside is easy for Ohio State. This is performing right on plan for Ohio State as the offensive tackle blocks “down” on Buckner — into that B gap, which is the intent of the Oregon defense. Complete “hat-on-hat” blocking–that makes me ill.
My friends — that screenshot above is a thing of beauty for Buckeye fans; after Buckner is out of the picture you see tremendous “hat-on-hat” blocking the way Oregon likes to do it! You see a perfect running lane for ‘Zeke (red arrows above), with every Duck defender at the LOS and the next level being accounted for by a corresponding Buckeye blocker. It is perfect, it is sickening, and it is really well done. A surprise to start the second half…. This play is the perfect “Counter” to the Hidden Bear defense, but it requires great one-on-one blocking, which OSU carried out. Above is a touchdown play where the Counter play by the Buckeyes is blocked and executed extremely well. Note how Buckner (yellow arrow above) is doing a great job defending the B gap as he is supposed in the Hidden Bear defense, but No. 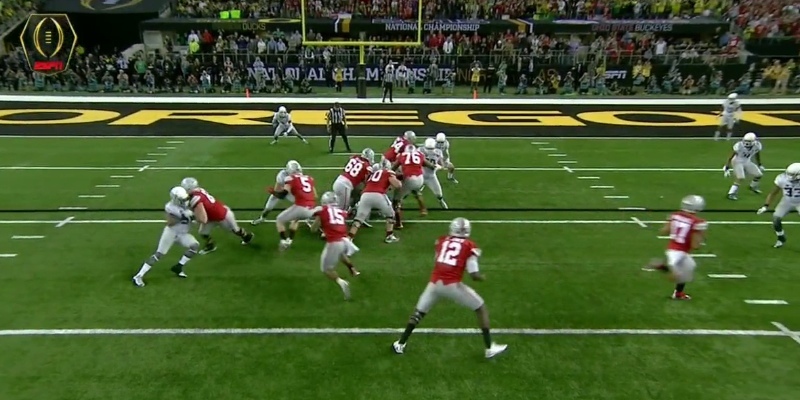 68 for Ohio State has an easy block down to keep DeForest out of the play. As an old offensive lineman who savors great blocking, especially in the open field….this play is one that I really admire. As an Oregon fan it makes my stomach turn, and gets me to pondering how often we will see this play used against us next year. You have to also consider the tactics in the use of the Counter play; Urban knew it would work, and would really hurt the Ducks, yet he did not use it until the second half. Why? Oregon had done well with halftime adjustments in the past and Meyer made sure that Oregon had no adaption time (Such as halftime) to regroup. He could not wait to use it though, as he sprung it on the Ducks in the first play of the second half! My friends…that is great coaching between finding the weakness and then exploiting it with a total package of surprise, Xs and Os, and timing. It was a tremendous combination of coaching and talent implementing it…the kind you will find in the National Championship game. I offer my congratulations and a salute to Ohio State. 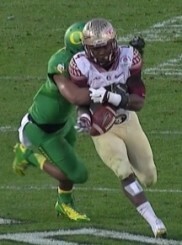 Now…why aren’t we running that play! I am dead serious; it is a play that is built for our offensive line as they too are superb at blocking in space and on the run. We have not run a Counter play since against USC in 2008, and I’ve often wondered why? Why didn’t Pellum adjust? Sometimes when you make on-the-fly changes it can backfire by creating mistakes which lead to explosion plays against you. He might have thought that our offense would score more (a safe assumption) and that as time went on the Ducks could defeat those blocks. That is the chess match and guessing game that makes you the hero or the goat as a defensive coordinator. Oregon did end up second in the Pac-12 in scoring defense, which is pretty darn good for Pellum in his first year. He and this defense will be better. We will see that play often next year, and I believe our players will become skilled at recognizing it up front and beating those blocks. While we at FishDuck.com will go back to our usual coverage of superb Oregon plays next week–please note that due to the Grizzled Ol’ Coach, Mike Morris,…..we have learned why the Counter play worked with an explanation unlike anywhere else in the media. It was painful, but worth the learning opportunity for us all. Attention Ohio State Fans: If you wish to talk Xs and Os and be the class fans that I know so many are as Buckeyes…you are welcome. However if you come into the comments to gloat, post snarky put-downs and backhanded compliments, or descend into name-calling, insults or profanity–you will be deleted and blacklisted immediately. To learn more Click-here.